The valve seats (1) for both the intake and exhaust valves are machined to three different angles. 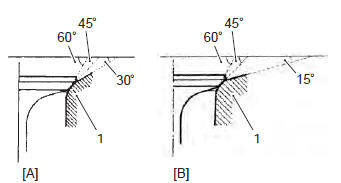 The seat contact surface is cut at 45°. the valve seat contact area must be inspected after each cut. Do not use lapping compound after the final cut is made. The finished valve seat should have a velvety smooth finish but not a highly polished or shiny finish. This will provide a soft surface for the final seating of the valve which will occur during the first few seconds of engine operation. The titanium valves are coated with an oxidized membrane treatment to resist wear but the membrane tend to removed if lapped after valve seat servicing. after servicing the valve seats, be sure to check the valve clearance after the cylinder head has been reinstalled. Refer to “valve clearance inspection and adjustment” in section 0b .